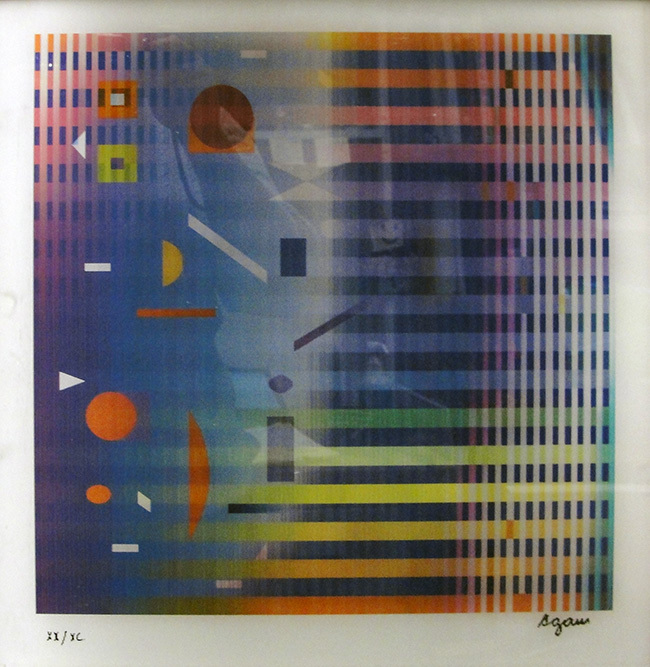 YAACOV AGAM RARE FABULOUS BEAUTIFUL AGAMOGRAPH. Hand signed & numbered by the artist. Artwork is in excellent condition. Certificate of Authenticity included. Additional images are available upon request. Yaakov Agam was born Yaakov Gipstein on 11 May 1928, in Rishon LeZion, then Mandate Palestine. Agam trained at the Bezalel Academy of Art and Design in Jerusalem, before moving to Zürich, Switzerland in 1949, where he studied under Johannes Itten at the Kunstgewerbe Schule, and was also influenced by the painter and sculptor Max Bill. In 1951 Agam went to Paris, France, where he still lives. Agam's first solo exhibition was at the Galerie Graven in 1953. He established himself as one of the leading pioneers of kinetic art at the Le Mouvement exhibition at the Galerie Denise René in 1955. In 1964, Agam wrote his artistic credo, unchanged since then. “My intention was to create a work of art which would transcend the visible, which cannot be perceived except in stages. He is also known for a type of print known as an “Agamograph”, which uses lenticular printing to present radically different images, depending on the angle from which it is viewed. Agam is the highest-selling Israeli artist. In a Sotheby's New York auction in 2009, when his “4 Themes Contrepoint” was sold for $326,500. He has participated in shows worldwide including many one-man exhibitions, including the retrospective exhibition held at the Musee National d'art Modeme in Paris in 1972. Click the button below to add the Hand Signed Marhin By Yaacov Agam Retail $3.5K to your wish list.